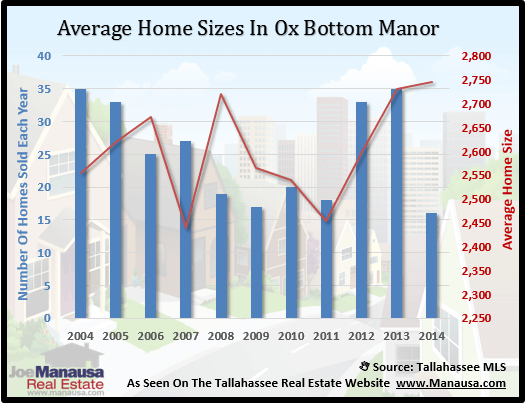 Home sales have cooled off in Ox Bottom Manor, a popular NE Tallahassee neighborhood which is coming off of two very strong years in terms of the number of homes that sold. But after home prices hit record lows and buyers flooded to these executive style homes, prices have risen and buyers have slowed. 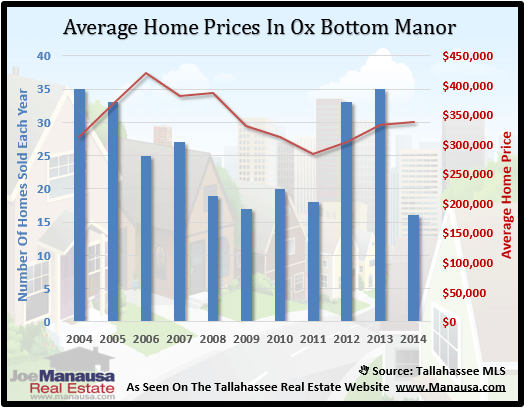 In our report, we will look at prices, values, and sizes of homes in Ox Bottom Manor, as well as show current listings in the Tallahassee MLS and all closed home sales going back to 2002. For all of the graphs found in this report, you will observe the number of closed home sales for each year (blue columns, measured on the left vertical axis), and an important real estate statistic shown in red (measured on the right vertical axis. Home prices have inched higher this year, where the average recorded sales price is $338,000 for Ox Bottom Manor. While the year has got off to a slow start, it still looks to be better than four of the previous six years. 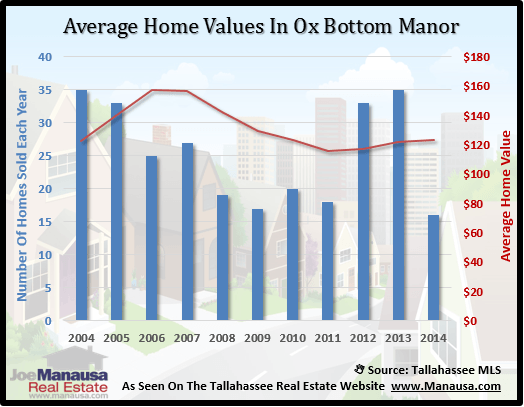 Average home values in Ox Bottom Manor have only moved slightly higher than the low established in 2011. Currently, the average closed home sales value is just above $126 per square foot. Over the past 12 years, the average home size sold in Ox Bottom Manor has ranged from 2,400 to 2,750 square feet. It's not surprising to see that this year is the highest on average, meaning that buyers are choosing the larger homes right now. This is very likely due to low mortgage interest rates which are propelling buyers to get "more home" for their dollar. The following list of homes are the most recent listings in Ox Bottom Manor. The following list shows home sales going back to 2002 in Ox Bottom Manor. I hope you enjoyed our September 2014 update on home sales in Ox Bottom Manor, please feel free to drop me a note if you have questions not covered in this report.